Automation Can Also Be Our Friend! Automation’s original purpose was to free us from boring, repetitive tasks that we’d rather not do. Like shopping. I really want one of those smart door locks or garage door openers that will open for me when I arrive home. That would be sweet! But that would cost a few hundred dollars and only save me a few seconds. Here is something to save you significantly more time at a much lower price! Here is an easy way to simplify shopping. 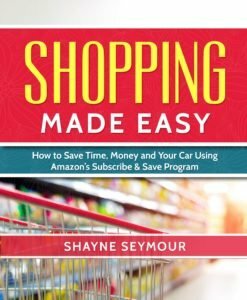 I’ve enjoyed the time and money I’ve saved with Amazon Subscribe & Save so much, that I wanted to share that with everyone. It hasn’t completely eliminated our need to visit grocery stores. There are a few items not yet available. But there is one store in particular that I try to avoid completely. Going there once every couple months instead of once per week is a luxury for which I would gladly pay! Reducing visits to that store and saving money….well that’s something I just have to share with you! I am pleased to disclose that all the links on this page are affiliate links. That’s right! I get a small commission on the sales of my own book. How cool is that! If you have any questions about the book or just want to tell me how awesome it is, please leave a comment below. I check comments constantly.